On Saturday January 30th we had our last dinosaur-themed program of the year. The programs over the past few months have been so much fun that I plan on bringing some of then back next year even though we won't have a dinosaur exhibit. This Saturday at 1 program was called The Reptile Connection and we learned about how all dinosaurs were reptiles but not all reptiles were dinosaurs. For example, the much-loved flying Pteradon was an awesome flying lizard who lived at the same time as the dinosaurs, but was not a dinosaur. 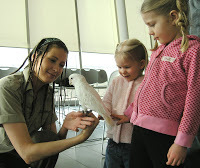 The guest speaker, Jolene from Petland, brought some bird friends to the program so we got to review the bird connection with dinosaurs. Some scientists say that birds are basically modern dinosaurs. The other things we've done in public programs at the museum in the past two weeks are related to movies. The family program, Dinosaurs in the Movies, was brought to us via video conference. The technology we used for the program is a new type of internet-based video conference loaned to us by RISE. 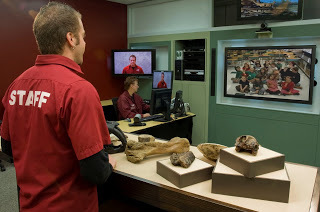 Our IT people worked with the team at Chinook Arch Regional Library System, to use web cams and the internet to link our audience in the Galt Museum to the Royal Tyrrell Museum. A more traditional video conference features fancy cameras and TV screens. We, however, broadcast the program using a projector onto a big screen in the Viewing Gallery. The program was very interactive with the audience talking to the Tyrrell interpreter, Colin Regamy, and the Tyrrell team bringing out fossils and animations to answer spontaneous audience questions. In addition to the fabulous movie clips and interesting information provided in the program, I think that the ability for the families to interact with the interpreter is what made the program so engaging and fun. It was clear that the adults had at least as much fun as the kids - which makes this a great family activity. The other dinosaur-movie program was our January Cafe Galt with Cory Gross. Cory presented his research on the history of the first full length dinosaur movie The Lost World. We have a podcast of his talk that I'll upload in the future.